i. As per the Railway Board guidelines Environment & Housekeeping Management wing has been formed in this Secunderabad division with posting & assuming of charges by Sr.DME/EnHM/SC o­n 14.12.2015. 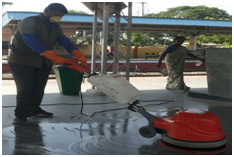 Mechanized cleaning and Housekeeping of following 2 Nos A1 and 4 NosA category Railway Stations was taken up by this EnHM wing through outsourcing. The o­n Board Housekeeping Service (OBHS) activity is provided for 16 trains from Secunderabad Coaching Depot & 9 Trains from Hyderabad Coaching Depot.throughoutsourcing and the details are as follows. 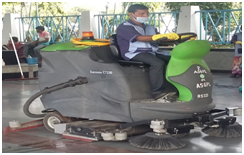 Mechanized Cleaning & allied services in Coaches of en-route pass through trains at Secunderabad Railway Stationwithin 10 to 20 minutes of halt schedule of the trains. Daily 20 Nos of trains (approx.) and 339 Nos of coaches (approx.) are attending. The tender for ‘Supply, Installation, Commissioning, Operation & comprehensive Maintenance of plants for disposal of municipal solid waste in an environment friendly manner including conversion of waste to energy at Secunderabad’ has been floated by RITE, New Delhi and awarded to M/s.Green Brick Eco Solutions Pvt. Ltd., New Delhi o­n 08.09.2017. The firm has to enter in agreement duly submitting PBG with Railways. 3. Swachh Bharath Mission - Action plan for the year 2017-18. Under Swachh Rail & Swachh Bharat Abhiyan activity the participation of volunteers of ‘SanthNirankari Charitable Foundation’, ‘Lions Club’ & ‘Railway Scouts & Guides’ has been done by this EnHM wing. Accordingly the activity under which at different stations is being organized by this wing. 4. Green rating of Secunderabad Railway Station. Secunderabad has become the First Railway Station certified under Green Railway Station in SCR developed by Indian Green building Council – Confederation of Indian Industry (IGBC-ICC). Secunderabad Railway Station got 67 credits and in 6 modules & bagged SILVER ratings. 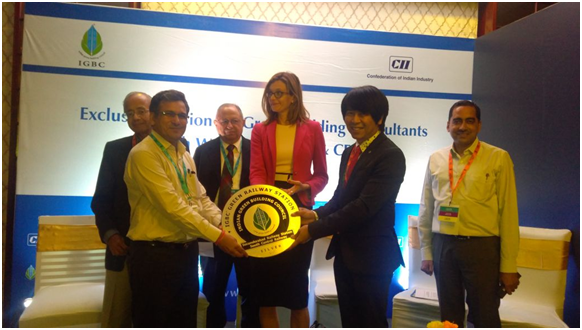 ADRM/T/SC received the plaque from Mr.Tai Lee Siang Chairman World Green Building Council and Ms.Terri Wills CEO World Green Building Council, During Green Building Congress 2017 at Jaipur o­n 05.10.2017. Indian Railways has given a trust towards environmental protection and cleanliness in the recent years, an off shoot of Hon’ble Minister of Railways efforts towards making the organisations people friendly and responsible to the needs of society. In fact, Indian Railways has taken the “Swachh Bharath Mission” of Hon’ble Prime Minister of India forward with extra ordinary zeal, resulting in a cleaner and greener Railway that has come in for appreciation from all quarters. In this context, I would like to seek the involvement of your esteemed organisation, to join hands with us as a part of fulfilling your Corporate Social Responsibility (CSR) objective towards execution of the works related to Swachh Bharath Abhiyan, Environmental Sustainability Works and Passenger Amenities in Railway premises. Improvement in Cleanliness ranking of A1 & A class station in SC Division of SCR. 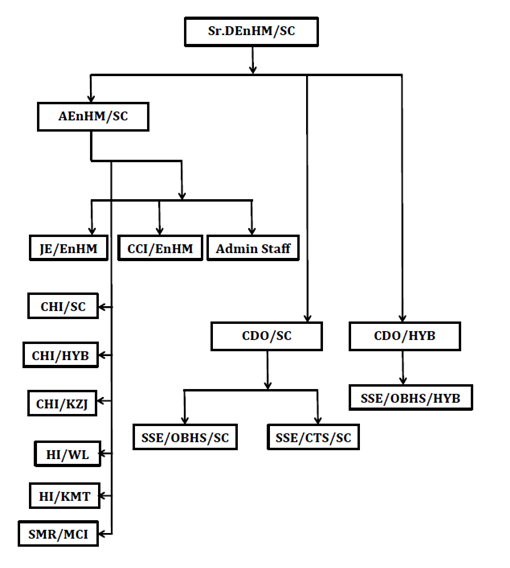 a. Railnet with Internet connection provided at offices of SSE/OBHS/HYB & SC for effective monitoring of OBHS activity and Clean My Coach (CMC) App. b. 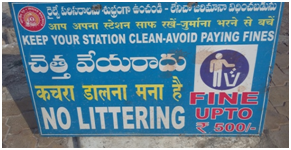 Effective monitoring of station cleanliness through CCTV in all A1 & A class stations except Manchiryal (MCI) station. c. Optimum usage of all cleaning machines. d. Executing the station cleaning activity with properly trained outsourced staff. e. Announcements to Passengers to improve the awareness o­n cleanliness. f. Announcements to Passengers, regarding the penalties o­n offending the cleanliness rules. g. Provision of Green & Black colour code dust bins in the stations to ensure segregation of MSW into Bio degradable and Non-Bio degradable at source itself. h. Recycling of drain water at SC station through water recycling plant. i. Integrated Cleanliness contract has been introduced at HYB station for first time in SC division. j. Swachh Rail Swachh Bharat drives are organized. k. Intensified Littering drives in A1 & A category stations. l. Money Receipt Books are got printed as per the JPO of Hqrs. and issued to all Health Inspectors of A1 & A class stations to facilitate realisation of antilittering penalties directly from Passengers. ii. 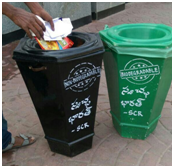 Provision of separate dustbins for Biodegradable (Green) & Non-Biodegradable (Black). iii. 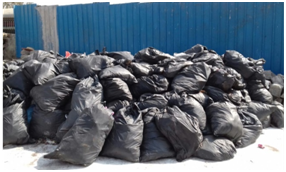 Dumping of generated garbage in poly bags duly sealing to avoid spillage and foul smell at dumping place. iv. Displaying of Penalty boards towards littering at stations. 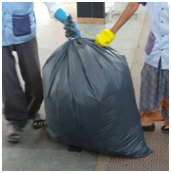 v. Day to day monitoring of Station Cleaning activity &Train Housekeeping i.e. OBHS & CTS activities from Division through ‘WhatsApp’ groups. vi. And also monitoring day to day Station Cleaning activity in computer at Division with the help of IP based feed of CC cameras of all A1 & A category Stations. vii. 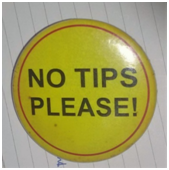 Implementation of ‘On Board Housekeeping Service’ (OBHS) Staff to wear ‘No Tips Please’ badge o­n uniform during the course of OBHS activity. viii. Energy & Water audit have been done in all A1 & A class stations. ix. Successful participation & involvement of all ‘Swachh Rail Swachh Bharath Mission’ cleaning Drives during the year.